Some neighbours become friends for years, others we greet politely as we pass. No matter how we connect with those who live in our neighbourhood, how we communicate matters. Healthy and thoughtful communication can change your community for the better, while neglecting to communicate or even ignoring your neighbours will erode trust in your community. One helpful way of understanding communication is to see it as a way of listening to one another before we use it to tell people what we think. Listening helps us know what good things are already happening, it helps us develop empathy for those around us, listening is a way of hearing stories and is the start of actually caring for others in a personal way. When we enter into our community with a posture to listen and hear the voices of others, we build a healthy foundation for all future connections. When communication starts with the intent to listen, it can grow in a number of creative ways. In our neighbourhood we began the Neighbours of Rainbow Falls facebook page. It’s a place where people post stories of lost pets, where people sell things, or plan get-togethers. There are now over 150 people on the page and it is a great way for hyper-local communication that is geared at a specific neighbourhood. Every year when we host our block party we also ask people to write down their name, home address, and contact information such as a phone number or email address. The very first year people seemed a bit suspicious, perhaps they wondered if we would use their information to sell them something. But as each year has gone on and we have come to know each other, we are finding that more and more people want to give their information. It has taken a few years, but we are now close to having a fairly comprehensive directory of our neighbourhood. This year we hope to print off the contact sheet as a way of helping neighbours know and connect with each other. While directories and facebook pages are a great way to facilitate communication in your neighbourhood, nothing beats face-to-face casual and regular connections between you and those who live around you. When we garden in our front yard on a warm summer evening, we meet dozens of our neighbours out walking dogs or meandering along on their bicycles. Many stop to chat and we love it. 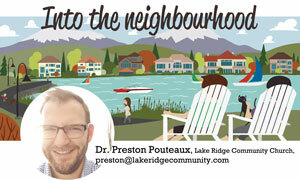 Other neighbours in the community who spend a lot of time outside also become magnets for connections. A few evenings ago as I was pulling my wagon with my two young girls and kind neighbours offered us popsicles. Other neighbours had a mud puddle and welcomed our kids to join in the messy fun of making mud pies. Each time we connect and truly enjoy our neighbours, it builds a bridge to help us listen with more intentionality. May you find creative ways to connect, listen, and communicate well in your neighbourhood, and in doing so discover the joy of loving your city and the people who live here with you.